Quantum confinement is to limit the size of the waves like you do in a guitar string by shortening the size of the string with your finger. Only in this case you are doing the same to the wave of light by limiting the wave by decreasing the size of the material to nano scale. That effect results in a change in the colour being emitted given that the colour differences are there due to the change in wavelengths. Hence you are getting a variety of different colours from the same material just like you can get a variety of tunes from the same string by shortening its length by holding it. This can have a wide range of applications (including sensors). Professor Mittleman: The reason that a chunk of gold is gold-colored has to do with the electronic level structure of the metal. In other words, it is a quantum effect, not easily explained by ordinary classical physics. When you make gold small, there are additional effects, completely unrelated to the electronic level structure, which dictate the color. In other words, the reason that macroscopic gold is gold-colored has essentially nothing to do with the reason that nano-gold is red. It is not as if this is a shift from yellow to red - instead, it is a completely different mechanism. In the case of a metal like gold, the mechanism is the excitation of a plasmon, which is a collective oscillation of all the electrons in the nanoparticle. The brief description of quantum confinement is applicable to semiconductors, where the number of free electrons is small (e.g., one per nanoparticle). When you have just one electron per nanoparticle, the dominant issue is the energy for that electron to be excited or de-excited - that is, the quantum confinement effect. On the other hand, in a metal the number of electrons is large, even in a nanoparticle (e.g., one per atom), so the description is understandably quite different. In that case, the electrons do not need to be excited out of chemical bonds in order to be free, so the energy of excitation is no longer an issue. Instead, you have the possibility of having all the electrons oscillating together, like water sloshing back and forth in a jar. That's a plasmon. And that's why nano-gold is red. Me: So does this mean that metals in general are exceptions to quantum confinement at nano scale given that metals will generally have much more than 1 free electron per nano particle or does this stand for gold only (why not other metals if in this case)? In short, the plasmon concept supersedes in case of all metals? Secondly, does quantum confinement still have a partial effect on the net result when talking of gold? As in, a participation to a minor extent as the size of the particles still has been reduced? Or does quantum confinement has no effect at all in case of gold for the reasons you gave (having more free electrons) and the change in colour is fully credited to plasmon? 1. I would not say that metals are an exception. I would say it a slightly different way. In semiconductors, the natural size of an electronic excitation (which is really both an electron and a hole, not just an electron) is in the range of 10 nanometers or larger, so quantum confinement is a big deal when your particle size is in that range. In contrast, in metals, the effective size of a free electron is much smaller, so that they still behave the same even if the metal particle is only 2 nanometers across - they don't feel 'squeezed' at all by the small size of the particle, since they're smaller. Pretty much any metal will exhibit plasmon effects, similar to gold. Gold is the one we talk about most often because it is one of the easiest nanoparticles to make. But color changes due to plasmons can be seen in any nano-metal. 2. The change in color of metal nanoparticles is entirely due to plasmonic effects. (Well, I guess I should say "almost entirely" just to hedge my bets, but I think it is really entirely.) In other words, you can describe the change in color using purely classical physics, with no quantum mechanics at all (since plasmons are essentially a classical phenomenon). Quantum confinement (in semiconductor particles) cannot be described using classical physics, so it is really a different thing entirely. 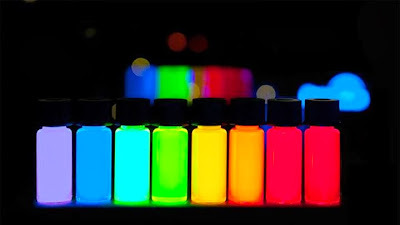 Now the question is how does quantum confinement affect the colour when the the applications of such do not actually go below the size of the atoms (which is ~ 0.1 nm) and actually don't directly squeeze the emission at atomic level? The relation is similar to a skier sking on a mountain and the height of the mountain. In this analogy, electron is the skier ofcourse. This can also be defined in semi conductors in relation to the exciton created by the absorption of light when electrons jump from their valance state to conducting state by absorbing energy. The electron leaves behind a hole and either drifts apart from it due to voltage or the hole and the electron start to orbit each other, hence creating an exciton. These excitons are much larger than a hydrogen atom and are the physical entity being directly affected by the quantum confinement in such cases as they may range from 2.3 nm (in ZnO) to 46 nm (in PbSe). Quantum confinement here directly affects their size and hence the levels at which they can exist due to the size of the material and this changes the colour the emit from red to green and to blue as the size gets smaller. This is also used to create 'quantum wells' by trapping excitons of different energy levels (say red trapped in green) in each other so that they can only travel in their plane and not in 3D. What use is a quantum well to us? They have a wide range of applications starting from DVD and CD lasers as well as the coloured (eg. red) lasers in laser pointers. Mass manufacturing the quantum well lasers are set of parallel processes which makes them inexpensive; a few rupees a piece. Quantum confinement in 3D; quantum dots, can be used to form optical fibres with near zero energy loss (hence data loss) over long distances making a possibility for extremely reliable and high data transfer rates. Quantum confinement in 2D; quantum wires, to solve the 'wiring problem' in nanotechnology where we have the nano components but are limited to wire them using larger sized wiring, to create P-N junctions and hence transistors in a whole new paradigm or even to be used as sensors. Quantum confinement in 1D; quantum wells, can be used to create lasers and other light emitters as explained above. Quantum confinement as a nano-physics concept can be applied to engineering applications that make life easier and technology the high end either in designing sensors or otherwise. Pakistan should soon take up its role on the high end of technology as these are concepts not far from the grasps of Pakistani engineers.